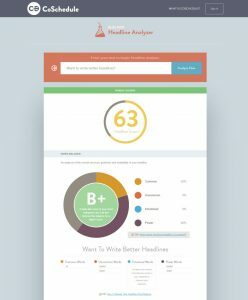 Headline Analyzer is a free copywriting tool that rates your headline’s ability to grab the reader’s attention. Simply place the copy in the field and the page will return with a complete, multi-point analysis of its potential. 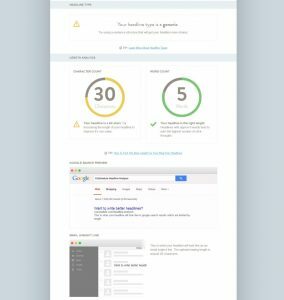 The application wears a recognizable but efficient Bootstrap layout. It displays the results as a stack of blocks delineated by shaded horizontal rules and alternating background hues. Stepping through the analysis results requires a significant amount of scrolling over static elements. 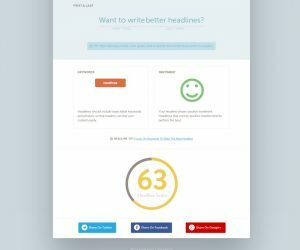 CoSchedule’s Headline Analyzer can be very useful for writers who are not quite versed in the art of writing catchy headlines. It can serve as a good learning tool since each score is accompanied by a brief but sufficient explanation of the reasoning behind the evaluation. On the other hand, there’s a significant amount of scrolling involved in discovering those scores down the page. We felt like the little information it provided us could have been relayed in a much more compact manner.